IN THE BODY OF THE GREAT SPIRIT. The people saw her walking off in the same direction from whence she had come, outlined against the red ball of the setting sun. As she went, she stopped and rolled over four times. The first time, she turned into a black buffalo; the second into a brown one; the third into a red one; and finally, the fourth time she rolled over, she turned into a white buffalo calf and galloped away. 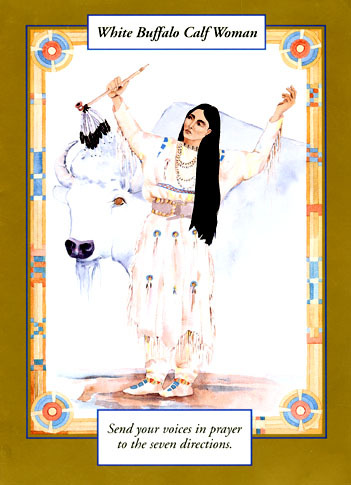 White Buffalo Calf Woman promised to return at the dawning of a new age ... and the white buffalo calf Miracle, born in August of 1994, has gradually changed color from snowy white to yellow to reddish brown, and to the almost black of her mother. According to legend, when all races are unified and peace returns to the earth, this buffalo will once again turn white. The Yellow, Red, Black and White race each were given a gift and a direction to work with. The four races need to come together for us to heal as a people.